You can make a reservation directly from here. Please click here. You can go to Hakuba Vally ski resorts by free and pay(to Cortina) shuttle bus. ・Please bring your own pajamas and tooth brush. 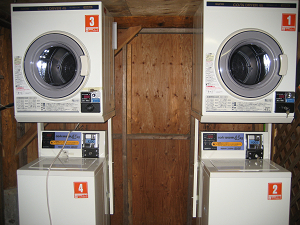 ・There is a laundromat in the neighborhood. ・ 7all deluxe rooms with ensuite. 2F・・・2 twin rooms (plus two beds in a loft) and 1triple room (plus two beds in a loft). cleaning of facilities, towel change and bedding changes. at a cost of 4000yen(big log house is 10,000yen) per once. To arrange extra cleaning, please call reception. Cleaning is possible by oneself. Cleaning utensils (vacuum cleaner etc.) are supplied for the rooms. ☆Credit card・・・ All major credit cards. Price is room charge (include 8% tax and no meal）. Over 5 years old child is same price of adult. Additional utility costs: 2,500 yen per night per cabin(unit). All 7 rooms with ensuite. No charges for babies with out bed (0 years old to 4 years old). 2,700 yen charge for babies if bed are necessary. prepare their own culinary delights. lodge (22 people maximum) for themselves. Ideal for groups of friends and families. These prices mean the Log hotel will be held exclusively for your group (no other customers).